Please join us for our annual Holiday Party and December Guild Meeting! It’s an Ugly Sweater Extravaganza! 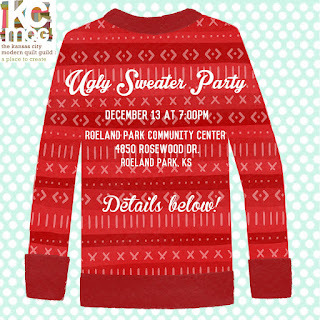 Please participate by wearing a fun and tacky as you wanna get sweater. Prizes awarded and there is a special category for those willing to MaKe or Craftily enhance their outfit! SWEATER- Play along and dress the part! FAT QUARTER- to participate in our Fat Quarter Lotto! we’ll use them for a get to know you mixer and swap! SHOW & TELL- bring something to show- holiday theme and regular quilty items are welcome!! !